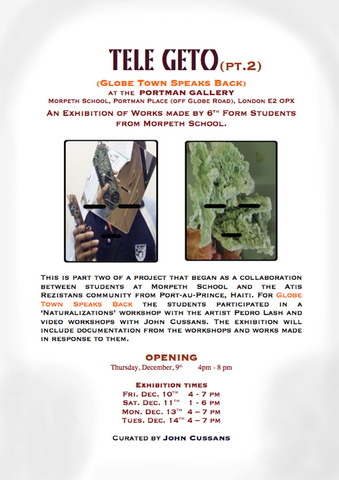 Part two of a project that began as a collaboration between students at Morpeth School and the Atis Rezistans Community from Port-au-Prince, Haiti. The students participated in a 'Naturalizations' workshop led by the artist Pedro Lasch and a video workshop with John Cussans. The exhibition - curated by John Cussans - included documentation from the workshops and the works made in response to them.